A navigation list (which provides a scrolling list with lots of options). A radiobutton list (which provides a radiobutton list that accepts multiple choices). A checkbox list (which provides a checkbox list that accepts one choice). 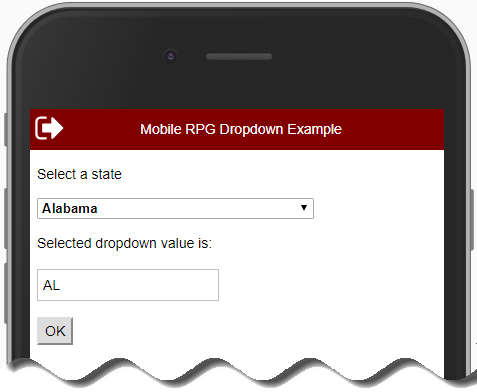 This article discusses how to use the DDSList control to provide a dropdown element for a Mobile RPG record format. When rendered this way, the runtime HTML is a select tag with option tags for each item in the dropdown list. This article’s example code is shown below in Figure 1a. When the OK button is clicked the selected value of the dropdown is shown in the textbox just above the OK button. The rendered dropdown control is populated with columns in an RPG subfile. The properties of the DDSList specify the field names and other subfile attributes. The list in Figure 1b below shows the DDSList properties, and their values, used in this example to render the dropdown. ListType Dropdown This field indicates the type of list rendered by the DDSList control. It can be Navigation, Radiobutton, Checkbox, or Dropdown. SelectedField DDSel This is a hidden field in the subfile row. This field is required but isn’t used when the DDSList is used as a dropdown. SelectedItemField DDCurrVal When the DDSList is used as a dropdown, this field is a getter/setter for the dropdown’s selected value. This field is always the same length as the ValueFieldLength and is a hidden field on the Mobile RPG record format (it is not a column in the DDSList’s subfile). SubfileName sbfDD The name of the subfile associated with this DDSList dropdown. SubfileControlName sbfDDCtl The name of the subfile controller associated with this DDSList dropdown’s subfile. TextFieldLength 24 The length of the field specified in the TextField property. ValueField DDValue The name of a field that is a column in the DDSList’s subfile that provides the value associated with the TextField property. ValueFieldLength 2 The length of the field specified in the ValueField property. Figure 1b. DDSList properties used in this example to render the dropdown. Figure 1c. The DDSList as defined in the ASPX markup. 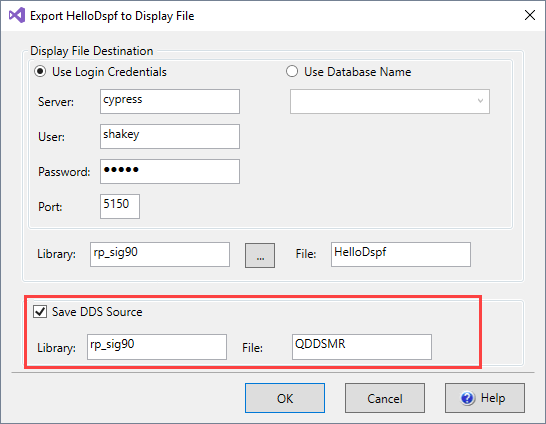 To fully understand the relationship between a Mobile RPG control and its underlying RPG program, it often helps to save the corresponding DDS source while exporting the Mobile RPG display file to the IBM i. Do this by using the options in the red box below in Figure 1d. The DDSList dropdown’s exported DDS source is shown below in Figure 1e. This source lets you clearly see that there are three columns in the subfile (two of which are hidden). The DDRList’s SelectField property produces the DDSEL field. For most subfile-driven Mobile RPG controls, this field is set to “1” when a row is selected and READC is used to read the selected rows. Because the DDSList’s dropdown only ever has a single selected value, the DDSList’s SelectedItemField specifies an RPG field that is a getter and setter for the dropdown’s value. As you can see in the DDS source in the figure below, the property this field produces (DDCURRVAL) is hidden. The DDSList’s dropdown logic automatically puts the dropdown’s selected value in this field. If you set this field in your RPG to a value in the list before showing the page, the list will be positioned at that value’s list position. Before the record format containing the DDSList dropdown is displayed, it needs to be populated with dropdown data. The code below in Figure 2a shows a way to do this. Declare a data structure for each dropdown item and a corresponding data array of this data structure. This data structure defines the data elements used to provide a given dropdown element’s text and value. States is an array of StateInfo. This array is the source data for the DDSList’s subfile. Figure 2a. Declaring a data structure and a data structure array for dropdown data. It enables separating the task of populating the DDSList subfile from the task of fetching that data (which usually means reading it from a data file). This makes it easy to have one routine that populates the array with test data and another that populates it with production data. The data structure array can be passed to other RPG programming to populate it, letting you further separate specific data handling concerns. The StateInfo structure uses field lengths dictated by the field lengths in the file that will ultimately be read to populate the States array. The LoadStatesList procedure below in Figure 2b isn’t concerned with how the States array is populated–rather, its job is to use the States array to load the DDSList’s subfile. Figure 2b. Populating the DDSList’s subfile with the States data structure array. In the LoadStatesList procedure above, GetStates returns the number of active elements in the States array. The For loop uses this value to know how many rows to write to the subfile. The GetStates procedure loads the States array for test purposes with five, hardcoded states. In a production app you’d change GetStates to read the data from a data file. In this case, the procedure’s return value (the number of elements written to the States array is hardcoded. In a production routine to fetch the states list from a data file, the return value would be dynamically determined from the number of rows read to populate the list. Figure 2c. Populating the data structure array with hard-coded data. As you can see, it’s not hard to use the DDSList to provide a dropdown control for your Mobile RPG apps. If you’re using the DDSList for this purpose, please send us a screenshot, we’d love to see!